France: Cercle Du Livre Precieux, 1963. First Thus. Hardcover. Fine/Fine. 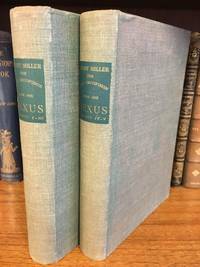 Stunning two volume set in slipcase of this early Miller classic of eroticism. Text in French with photographs by Emil Cadoo. Fine condition in fine slipcase. Attractive production. Paris: Obelisk Press, 1949. 2 vol. ; 368, 326 pp. ; The books are foxed and slightly yellowing; cover is darkend and slightly stained; else in stern condition; Limited first edition; Exemplar No. 1883; Size: 19.5 cm Tall. First Edition, Limited Edition. Hard Cover. Good. Paris: Obelisk Press, 1949. Cloth/no dust jacket Octavo. Hardcover. Good. two volumes (volumes 1-3 and 4-5), gray cloth, green label to spines, gilt lettering, no dust jackets, 368/326pp, # 917/ 3000, labels and lettering to spine lightly faded, scratch along spine of volume one, small water stain to rear cover of volume 2 and to front and rear covers of volume 1. Grove Press. PAPERBACK. 0802151809 New Condition. . New. Paris: Obelisk, 1950. Bound in green wraps wraps, stamped in black. This is the second edition, but the first combined edition that contains all five volumes of the book. A small tear to bottom of spine and scuffing to extremes, but overall, most acceptable. 634 pp. . First Edition. Soft Cover. Very Good/No Jacket. 8vo - over 7¾" - 9¾" tall. GROVE. New. 8.27 x 5.39 cm. New York: Grove Press, c1965. First Am edition, first printing. Paperback. Good condition, paper aged. 634p. London. London: Calder & Boyers. Near Fine with no dust jacket. 1969. 1st Edition. Hardcover. A bit of bumping to extremities of spine, else Fine. Pages are crisp, tight, book appears unread. . Miller's most controversial book, this is the first British edition. . 8vo - 8" to 9" tall. 506 pages. D1 . Tokyo: Keimeisha No date. Circa 1954. English text. Complete in two volumes. Paper covers with dust jackets. Short tears at head of jacket spine of both volumes. A solid set. . Very Good. Grove Press. PAPERBACK. 0802151809 Like New Condition. . Fine. London: Olympia Press, 1957 First Thus. Paperback. Good. 12mo - over 6¾" - 7¾" tall. Grove Press, 1965. Please email us if you would like further information or if you would like us to send you a picture of the book. Thanks for looking! . Mass Market Paperback. Good. 16mo - over 5¾" - 6¾" tall. Grove Press, 1965. Three volumes. 506, 640 & 316 pages. The Miller masterpiece... Reprint.. Softcover. Fine. 8vo - 7¾" - 9¾" Tall. New York: Grove Press , 1st paperback printing. (Mass market paperback) 634pp. Very good. Previous owner's name. "Book One and Book Two complete in one volume". Series: Rosy Crucifixion 1. (Fiction, Autobiography). Milano: Mondadori, Oscar , 1992. Brossura (wrappers). Ottimo (Fine). Introduzione di Guido Almansi. 16mo. pp. 684. Ottimo (Fine). .
Grove Press. PAPERBACK. 1994. :Binding:PaperbackVendor: Grove PressSubject:Fiction | General . NEW. Penguin Classics, 2015 Book. New. Paperback. New and in stock.